Introduction – Kuruvathi, also referred as Kuruvatti, is a village in Bellary district of Karnataka. It is located on the bank of Tungabhadra river. the village is famous for its Mallikarjuna Temple and annual cattle trade fair held during February-March every year. The earliest antiquity of the town can be traced back to the Western Chalukya rulers whose inscriptions are found in and around the village. The earliest inscription is dated 1087 CE which falls under the reign of the Chalukya king Vikramaditya VI. During the Western Chalukya period, the town was made famous by king Someshvara I. An inscription an Balligavi mentions that on 29th March 1068 CE, king Someshvara I performed the rites of supreme yoga and in the Tungabhadra at Kuruvatti, the master of the world Ahvamalla ascended to heaven. A reference of this is also found in the Vikramankadeva-charita of Bilhana, which mentions that the king, being attacked by a malignant fever for which no remedies were found to be of any avail, went to Tungabhadra, and there, after bathing and meditating on Shiva, walked into the river until its waters reached his throat, and so ended his own life. This event would have put Kuruvatti on the map of the religious, pious sites during the Western Chalukya period. 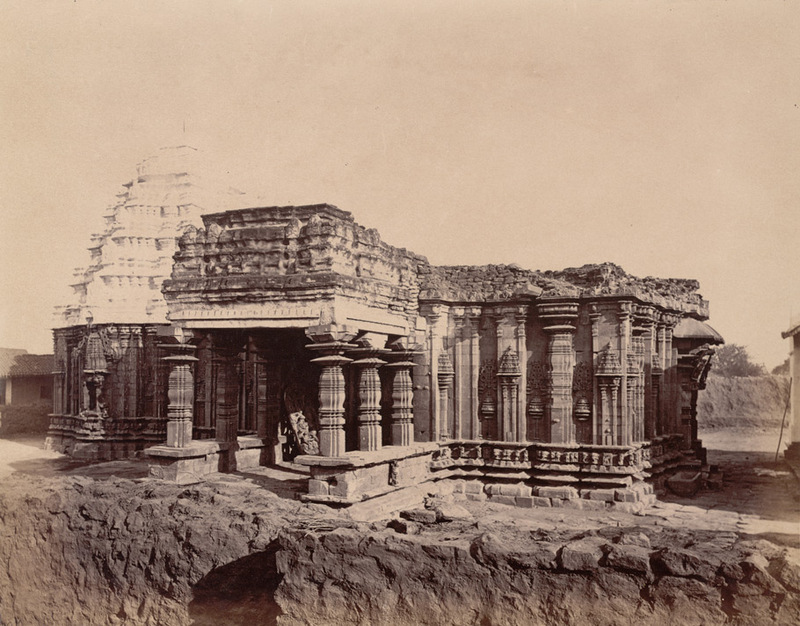 It would not be far fetched thought if we state that the Mallikarjuna Temple was built as a memorial to commemorate this event by the later descendants of the king Someshvara I, either by Someshvara II or by Vikramaditya VI. An evidence in this support comes from the inscriptions of this place where the lord of Mallikarjuna temple is referred as Ahavamalleshvara, after king Ahvamalla (Someshvara I). The village gained more importance when it came under the Hoysalas. The credit of this goes to saint Lokabharana who was the raja-guru (royal priest) of king Ballala II. Lokabharana made Kuruvatti his abode and thus the town was frequented by the royals and nobles. Many grants were made during that period, making the village rich and prosperous. The chief queen of Ballala II, Padumaladevi, also made a grant at Kuruvatti to god Ahavamalleshvara. The village also started to be referred as Dakshina-Varanasi during this period. Monuments – The only monument of interest here is the Mallikarjuna Temple. Mallikarjuna Temple – This east facing temple is consisted of a garbha-griha (sanctum), an antarala (vestibule), and a mandapa (hall) with three entrances. In front of the temple is another modern mandapa housing Nandi. The temple vimana is noticeable for its tall walls which accentuate its height though it does not have very high shikhara. The mandapa has porches attached to its lateral entrances, on south and north. The eastern entrance is not provided with a porch and the reason would be that it was fronted by another mandapa to house Nandi. This mandapa is now a modern structure however in the past there would have been a mandapa coterminous with the temple. The eastern doorway of the main mandapa is most elaborate among others and the reason is the exquisite bracket figures adoring the entrance, three such figures are still in situ as others had been carried away to various British Museums. The door has six rows (shakhas) carried till top and merging towards the lalata-bimba. The lalata-bimba has Gaja-Lakshmi, being bathed by six elephants. About these bracket figures, James Fergusson writes ‘All the details are sharp and the carving so good that even at Halebid it would be difficult to prove out any individual piece showing more complete mastery over the material than the brackets representing female figures with encircling wraths on the fronts and inner sides of the capitals at the east entrance’. Because of its three entrance, the interior of the mandapa is quite lighted. Its central ceiling is supported on four pillars, bases of whihc are carved exquisitely. each pillar has a square base, all the four faces of which is carved with an image housed inside a Nagara shrine. In those image, we find three times Shiva, three times Vishnu, two times Brahma, three times Surya, Bhairavi, Kali, Ganesha, Sarasvati and a saint. The antarala does not have a doorway but a freestanding torana supported on two pillars. The niches formed by loops emerging from makaras has Shiva in middle and Brahma and Vishnu on his either sides. A similar torana is also found in Dodda-basappa temple at Dambal and Kalleshvara temple at Bagali. Few loose sculptures are kept in this antarala. Two images of devotees, one showing a couple and one showing two ladies, an image of Bhairava and Shiva. The garbha-grha is a simple square structure housing a Shivalinga inside. Its entrance is elaborately carved in five shakhas (rows) with shaiva dvarpala on the jambs. The outside vimana has three niches in three directions. Image of the southern niche is now damaged however it was largely intact when Alexander Rea visited the site in 1896. From his reproduced picture, it seems to represent Bhairava. Western niche also has a damaged image however from its remains it is clear that it depicts dancing Shiva. Northern niche has Ugra-Narasimha. The projections and recesses in the wall are decorated with Dravida shrines, projections have Dravida shrine supported on two pilasters whereas the recesses have small Dravida shrine over a single pilaster but with a torana above it. There are some interesting loose sculptures kept inside the mandapa. 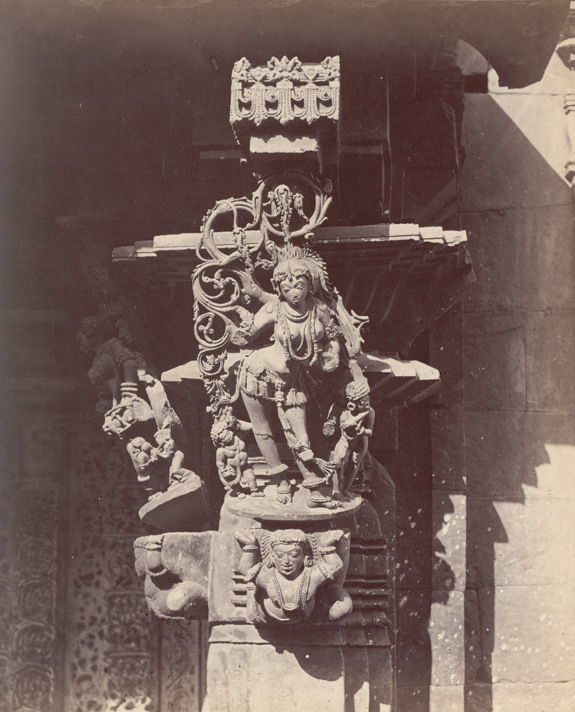 In the southern porch, an image is placed which Patil identifies with the Western Chalukya king Someshvara I. This image shows a royal person sitting with two females on either side, probably his wives, accompanied with two female attendants. Though the image carries no inscription, however knowing that Someshvara ended his life at Kuruvatti, it would not be a far fetched idea to identify this person with the said king. Another image is of Surya with a serpent canopy above his head. Also found is an image of Ganesha. The date of the temple cannot be decided convincingly due to missing foundation inscriptions. However, based upon its existing inscriptions, it can be safely said that this temple would have been constructed after the death of the Western Chalukya king Someshvara I which took place in 1068 CE. Gerard Foekema puts the temple between 1070 & 1090 CE. 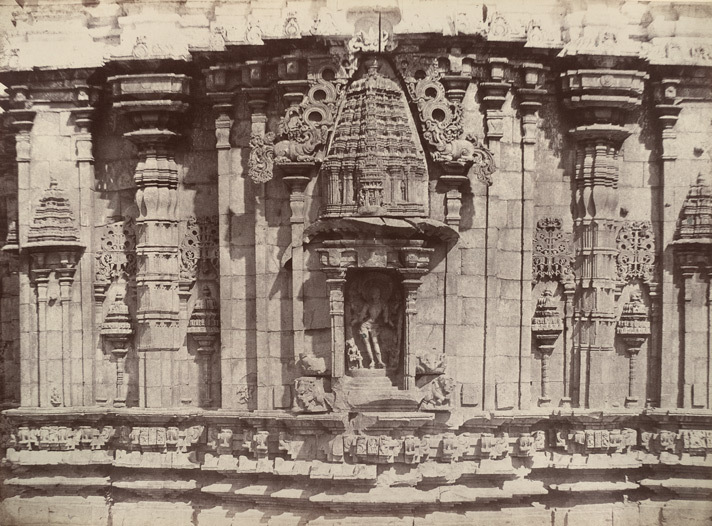 On the wall behind the sculpture of a royal personage in the southern entrance into the Mallikarjuna temple – ARIE, 1952-52, no B 218 – dated in the Chalukya-Vikrama year 11, corresponding to 1087 CE – Damaged, records that the Urodeyas of the Brahmapuri village Kuruvatti made a gift of land for flower garden and entructed it to Abhinava Va[ji]dev. On a slab set up near the Kalleshvara Temple – South Indian Inscriptions vol IX, no 165 – dated in the Chalukya-Vikrama year 24, corresponding to 1099 CE – refers itself to the reign of the Western Chalukya king Vikramaditya VI – Suresvara-Panditadeva was ruling Bennevuru-12. It records the grant of land and taxes on grass, firewood, vegetables, fruits and cotton exported from and imported into the village Kuruvatti, together with a money grant, for the service of the god Abhinava-Somesvara and for feeding ascetics in the temple, made by the two-hundred Mahajanas of the village with their chief Kalidasa, in the presence of Lakulisvara-Pandita. It describes the genealogy of the Dandanayaka Kalidasa and the warlike and religious spirit of the two-hundred learned Brahmans of Kuruvatti. Kalidasa is described as a Brahman of Visvamitra-gotra and is called gotra-pavitra. Lakulisa-Pandita’s spiritual teachers are also named. The record has excellent poetical merits. It is stated to have been composed by Srikanthasuri. The engraver was Kaloja. On a slab set up in Mallikarjuna temple – South Indian Inscriptions vol IX, no 169 – dated in the Chalukya-Vikrama year 29, 1104 CE – refers to the reign of the Western Chalukya king Vikramaditya VI – states that the Mahajanas of the agrahara of Gandaradityana-Holalu having complained to the emperor that the Manneya Boppaya, who had captured Holalu, was plundering the village and killing even the Brahmans, the emperor sent for him, chastised him and took from him an undertaking that he and his descendants would not have a claim to the Manneya of Holalu. Boppaya did so in the presence of the people of the thirty-two-thousand province contriving Bennevuru-12, Nirugunda, the two Hadangiles, Mangola, Bidirahalli, Hahanuru, Honnavalli, Kuruvatti and Balguli; and after drinking water at the temple of Tripurantakadeva, he set up this stone. On a broken slab lying near the Anjaneya temple – South Indian Inscriptions vol IX, no 290 – This consists of two parts and is much damaged. Its date is lost but it refers itself to the reign of the Western Chalukya king Vikramaditya VI – mentions his subordinate Mahamandalesvara Sankaradeva. From the second part it appears that a gift of land was made. On a beam in the Mallikarjuna temple – South Indian Inscriptions vol IX, no 389 – dated in Saka 1104, corresponding to 1181 CE – It states that while the Gutta king Vikramaditya II was ruling over Beluhuge-70 and Bennevur-12, his Pradhana, Susanga-Dannayaka, with the permission of the Mahamandalesvara Vijaya-pandyarasa, is said to have made, in the presence of bacharasa and the Mahajanas of Kuruvatti, a grant of 70 mattars of land for the service of the god Ahavamallesvara in addition to the vritti-land which had been formerly granted by Vikramaditya, the elder. Lokabharana received the gift. On the same beam as above – South Indian Inscriptions vol IX, no 320 – dated in Saka 1117, corresponding to 1194 CE – refers to the reign of the Hoysala king Vira-Ballala II – records that while the king was in the neelevidu of Balguli, he made a gift of villages Bada and Mukkurabbe in Bennevuru-12 to Lokabharana-Munindra for repairs, offerings and etc. to the temple of Ahavamallesvara. Chandarasa of Bennevuru-12 is mentioned. On the same beam as above – South Indian Inscriptions vol IX, no 390 – This much multilated and dated in Saka 1117, corresponding to 1194 CE – It states that Ballala-Bhupa, probably the son-in-law of the Gutta chief Vikramaditya II, made some gift to Lokabharana-Munindra for the service of the god Ahavamallesvara. At the same place as above – South Indian Inscriptions vol IX, no 391 – not dated – The five hunrded svamis of Ayyavale, who are described as setting the servants of Yama in motion, as roaring with the thunderbolt in hand, as giving their enemies to Yama and as generous to the submissive, are said to have gathereed together with the Nanadesi, Settis etc., in Kuruvatti and made a gift of one paga of the hejjunka tax to Lokabharana-Munindra or the service of god Ahavamallesvara. As this Lokabharana is mentioned in above inscription no 389, the present record may also belong to the time of Viramaditya II. On the same beam above – South Indian Inscriptions vol IX, no 337 – This undated record refers itself to the reign of the Hoysala king Vira-ballala II. The Mahamandalesvara Gommadeva, expert in sastra and promoter of the glory of the Yadavas, is said to have mae a gift of 36 mattars of land to the north of Haruhe in Bennevuru-12 for the repairs to the temple and the service of the god Ahavamallesvara and placed it in the charge of Lokabharana. On the wall of the right of the southern entrance into the Mallikarjuna temple – South Indian Inscriptions vol Ix, no 323 – dated in the 7th year of the reign of Hoysala Vira-Ballala II, probably 1197 CE – The king’s Mahapradhana Uttarakka-Heggade and Mahadeva-Dannayaka of Arasiyakere and the Heggade Jannayya are stated to have made a grant of certain cesses on looms, artisans and oil-mills raised in Kuruvatti, for the service of the god Ahavamallesvara and handed it over to rajaguru Lokabharana-gurudeva. 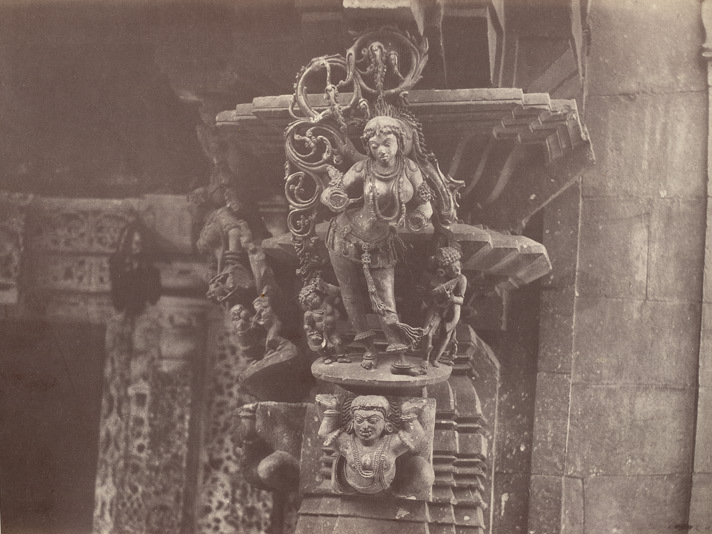 On a capital of a pillar, proper right of the Mallikarjuna temple – ARIE, 1952-53, no B 216 – dated in the 15th year of the Hoysala king Vira-Ballala II, corresponding to 1204 CE – Registers a gift of 2 ganigana-mattars of land to the god Ahumalleshvara by the mahajans eaded by the Urodeyas, etc., of the village Kureti. The gift was entrusted into the hands of rajaguru Lokabharanadeva. On the wall to the right of the southern entrance into the Mallikarjuna temple – South Indian Inscriptions vol IX, no 325 – dated in the 15th year of the Hoysala king Vira-Ballala II, corresponding to 1205 CE – The Bhandari Sovarasa, who was the Mahapradhana of Padumaladevi, the chief queen of the Hoysala king, is stated to have made a grant of some land for the service of god Ahavamallesvara of Hiriya-Kuruvatti (surnamed Dakshin-Varanasi) to rajaguru Lokabharanadeva. Bhandari Sovarasa was incharge of Guttolala-nadu. On the capital of a pillar, proper left of the Mallikarjuna temple – ARIE, 1952-52, no B 217 – not dated – mentions the two brothers Gudayya Setti and Karna Setti and seems to record a gift of one mattar of land out of the 26 mattars to the god Ahavamalleshvara. On another beam in the Mallikarjuna temple – ARE, 1918-19, no 219 of 1918 – registers gift, by purchase, of land to the temple of Ahavamalleshvara by two Settis. Brahma image in Pennsylvania University Museum, Philadelphia – Chavundoja the architect of the temple of Trailokyamallesvara of the glorious (town) Kuruvati, the son of Gulugoja, the purifier of (his) race (gotra), the worshipper of the feet of the illustrious (teacher) Vadideva, a servant of the (religious congregation) Sarasvati-gana, the son of women other (than his wife) and the pupil of Balla(ha) made (this) image of Brahma.” (The Sarasvati-gana was a Jain sect). How to Reach – Kuruvathi is situated in Bellary district and located about 10 km from Halavagal, 36 km from Ranebennur, 35 km from Davanagere and 30 km from Harihar. The village is tagged on Google maps however the temple is not tagged, however once you reach the village you will not find difficulties locating the temple. Fergusson, James (1910). History of Indian and Eastern Architecture. John Murray. London.